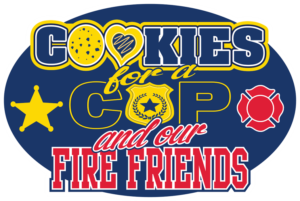 The fact that I’m logged in here on the back end and writing up this post is a great sign that the work has officially begun for the 2017 Cookies for a Cop 4th Annual Campaign of #SweetKindness!! Our campaign delivery dates for 2017 will be October 9-13th. Now having had a chance to look over the spreadsheet of those already interested to get on board, I can tell we are going to be off to a great start. While I would have liked to have started one month earlier, I am not going to major on the minor. One of my big things here with this campaign (and life in general) is that we do what we can, when we can. If our leaders can come back each year, great. Need a year off, no worries. Decided to not come back at all for whatever reason, we totally get it. Life changes and we just have to roll with the punches and take our time and energy where it is needed in that moment. It is this paragraph (above) that I want our past leaders to keep in mind. If you can’t this year for one reason or another, please do not hesitate to let us know. We are so very understanding and won’t think anything different. That said, I do ask if you could take just a quick moment to write back and let me know so I can take your name off the list for 2017 and make sure we get your department covered in other ways, if possible. Also keep in mind that should life throw you a curve ball mid-campaign before deliveries go out, we get it! Just let us know so we can make sure to keep our numbers, departments, and all those glorious stats current. You may be wondering as you read through this post, what is the game plan at this point? I am working on updating the Leader Kitchen. This is the area that we come together and stay on the same page. This is our “headquarters”. Anytime you need anything, it will be via the Leader Kitchen that you will want to look as most everything needed can be found. If it’s not there, let me know and I will get it there for you and everyone else. The leader list: I will be adding the past leaders who have filled out the leader form back to their past departments. Should past leaders wish to take on more, I will need to first make sure the department is not being covered by someone else. Newly added departments are always on a first come, first serve basis. Period. Past leaders will always have first dibs to their last year’s departments but this “first dibs” status is only for a short time before I open it up to the rest of the country so make sure to let me know soon. Last year was the first year I tried to move some departments around a bit and it was not a good decision so this year – past leaders get first come on their old departments and from there, first come, first serve for all. I hope you understand. If you are returning and want to secure your departments (if you’ve not yet), fill out THIS FORM. This is a must or your departments will go to someone new after May 31st. The leader list will show on the site (homepage) and this is where the excitement really gets going. Nothing gets me more motivated and more excited than watching that list and those numbers GROW, GROW, GROW! Cookies for a Cop was built on the idea of kindness. During a time of turmoil, we simply wanted to let our protectors know that they were (and still are) appreciated. In 2014 when we got our start, we took a simple idea and made it a 30,000+ cookie delivery effort in 24 states in just 2.5 weeks. This journey has been amazing and we are so excited that you are considering joining us! Leaders must be approved. In order for this to not be a free-for-all revolving door at our departments, to work to ensure safety, and for numerous other reasons, we need a point of approved contact. Once you fill out the leader request form, I will reach out to you and let you know how to go about approval. We have had hundreds of leaders go through this process and can assure you that it is a painless process that serves great peace of mind for us and those we are serving. Once approved, you will gain access to the Leader Kitchen and all of the details to make for a successful campaign. You are able to request as many or as few departments as you’d like. Believe me when I say that whether you want to take on 30, 300, or 3000 to serve, we are so super excited to have you on our team! (Keep in mind the first come, first serve basis mentioned above with past leaders having first dibs). Updates specific to leaders will be posted in the leader kitchen as we go so make sure you check back every so often – especially as we close in on delivery week. I also put out occasional updates and shout outs for our leaders to let them know of random things as we go so you may want to make sure you also follow our Facebook page found here. Ready to get on the list? If you are new to our leader list and want to get approved, read through our helpful information and make sure to fill out the leader request form. GO HERE to read up and fill out that form. Do you still have questions? Feel free to reach out via the contact page here or via my new email for this year at becky@cookiesforacop.com. I will make every effort to get back to you as soon as possible but know that it could take a few days and know that most work gets done on the weekends.